Thought I’d share my demo reel, which I use for commercial gigs. It features work I did for The Coca-Cola Company, Hilton Hotels and a video game score for Cogent Education. There’s also a pop tune at the end for good measure. Enjoy! My latest pop tune, “Ice Cream”, was inspired by Rick James and Prince. It’s an electro-funk composition with a super catchy beat. This is my first pop tune available on all major streaming services, see the links below to check it out. I thought I’d share what I learned about the process. Have it mixed and mastered professionally. It makes a difference, especially when streaming on different platforms. The mastering engineer will add correct metadata, so it can be tracked and monetized. Register it with either BMI or ASCAP. I’m a member of ASCAP. They will give you a registration number connected to the metadata in your track. Publish it through CD Baby or any other publishing company. CD Baby charges a one-time, $35 fee for a single or $50 for an album. They’ll need your registration number from ASCAP or BMI to track downloads and streaming. Once it’s published, it’ll can take several days or several weeks for your song to first appear on Apple Music, iTunes, Spotify, Pandora, Tidal and all the rest. CD Baby will track the streams for you and send a check each quarter. Next, you got to promote it through paid advertising, digital radio, terrestrial radio and/or social media. That’s where the real work begins. Nobody will find it unless you push it. Prince fans, take heart. According to an article on HuffPo, a surprise new EP containing six unreleased tracks recorded between 2006 and 2008 will be released this Friday, April 21, 2017. It will be available on Apple Music, and the title track, “Deliverance” is already available to stream on a number of services. The producer, Ian Boxill has been working on this music over the last year and planned the release to coincide with the one-year anniversary of Prince’s Death. Paisley Park and Prince’s estate have filed a lawsuit claiming the producer is “trying to exploit one or more songs for his personal gain”. We’ll see what happens. I’m just glad we have some new tunes from The Purple One! I was honored last week to have the opportunity to present my music marketing research at the 2016 College Music Society National Conference in Santa Fe. My wife, Jennifer Jones-Mitchell, President of Brandware PR, and I participated in the poster presentation format in the main exhibition hall. We met some amazing, talented professors and musicians representing colleges from across the USA. My wife was able to share her immense expertise and inspire attendees to take advantage of social media resources to reach a global audience. Our research features case studies of creative marketing campaigns, streaming services, music licensing data and much more. Have a look at the SlideShare below and don’t hesitate to reach out to me or my wife with questions or comments. Feel free to share as well. Click cms-presentation to download the original PowerPoint. Friday, I received a nice letter from the College Music Society. They selected my conference proposal! Jennifer Jones Mitchell and I will be presenting at the 2016 CMS National Conference in Santa Fe. We’re excited! Our topic is “Marketing Your Music Online: A Guide to Social Media for The Musician”. The conference will be late October at at the Eldorado Hotel & Spa, the Hilton Santa Fe Historic Plaza, and St. Francis Auditorium in Santa Fe, New Mexico. Does Your School Offer Music and Technology Courses or Degrees? My proposal to the College Music Society, Open Discussion Forum was accepted in December. It’s now live at the link below since January 01, 2016. It will remain open until the end of the month. If your school offers music and technology classes, please take the survey and share your experience. This study will collect data on how traditional music schools are adapting their curriculum to include a greater emphasis on preparing students for music careers that include aspects of digital music composition, performance and production. This data will become part of my presentation on the same subject at the CMS conference in Alabama. Since Apple introduced the iPod in 2001, major labels have gradually lost control of the market. They’re no longer the gatekeepers to success they once were. In fact, with the rise of social media, smartphones and streaming services, it has become unnecessary to sign a record deal. According to the Mirror, Emma McGann is a 25 year old struggling singer who beat George Ezra in the charts, and she’s nipping at the heals of global superstar Ed Sheeran. She started as a local artist performing in clubs and talent shows, but she was unable to attract the attention of major labels. So, she decided to start performing online from her bedroom using a website called YouNow.com. Since October 2014, she has generated 70,000 followers and her debut hit “You Mess Me Up” has reached number 14 in the UK charts. 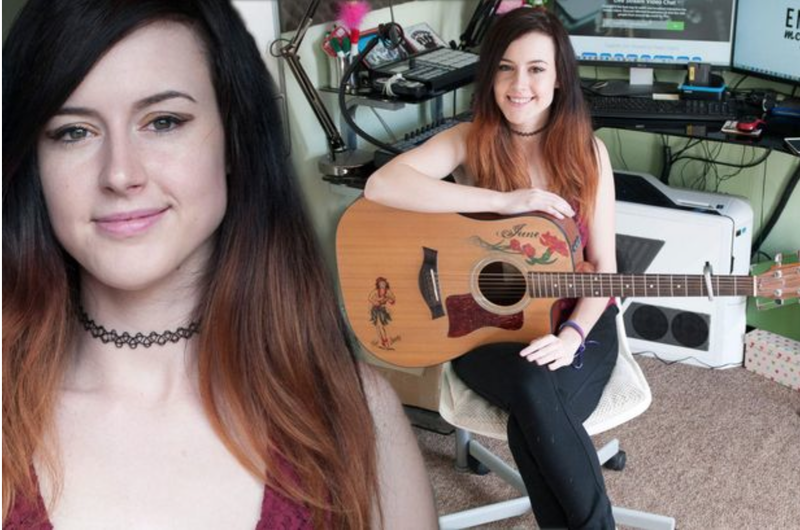 She now makes over £2,000-a-month performing live streaming gigs from her bedroom. Amazing! YouNow.com is a live video streaming service, which anyone can join and create a channel to discuss any topic, play music or whatever. Essentially, it’s your own broadcast channel, which anyone in the world can watch without logging in. It’s like having your own cable channel and people can tip you using bitcoin. Viewers can search topics including music channels, which feature a number of live streaming artists 24/7. It’s a huge opportunity for musicians to reach a global audience without a major label. Lindsey Stirling is a dub step violinist who made $6 million on YouTube without a record label. According to aux, the major labels decided not to sign her in 2007. So she created her own YouTube channel. Her Wild Wild West and Game of Thrones inspired videos have built a huge online following. She makes her money through ad revenue, direct music sales, sponsorships and live performances. The major labels are desperate to sign her now. This bottom line is, opportunities for musicians to generate revenue online are only limited by imagination and sweat equity. So grab your instrument, create a marketing plan and start making money.